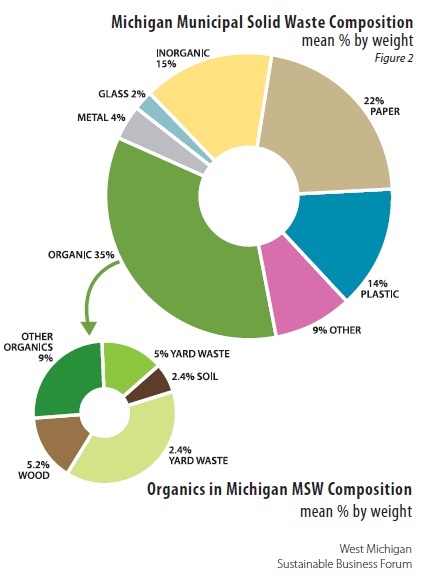 Organics are the single largest component of Michigan's municipal solid waste (MSW) stream at 35% by weight. Comprising about one-third of both the municipal waste and recycling streams. Diverting organics from disposal is critical to doubling Michigan's recycling rate and accomplishing the Governor's goal. While organics present their own collection and diversion challenges, they are unique in that various organics that can't be fed to people or animals can be collected and managed together. Organics do not need to be separated into component parts, as is the case with inorganic recyclables like paper, glass, metal, and plastic. Instead, organic materials are best managed by creating an optimal environment for and controlling the biological decomposition process. The Michigan Organics Council, a council of the Michigan Recycling Coalition, recently released a report titled The State of Organics Recovery in Michigan: Priorities & Recommendations. The report highlights the value and importance of productive organics management and potential impacts on key Michigan industries. It covers the history of Michigan policy as related to solid waste management and the Yard Waste Ban, as well as the benefits of organic waste prevention, composting, and anaerobic digestion, and the use of compost to enhance Michigan's soil to the benefit of the agriculture, landscape, and transportation industries. Large-scale, centralized operations and community-based programs create beneficial organics management opportunities that demonstrate sizable potential to create jobs and foster new local businesses. 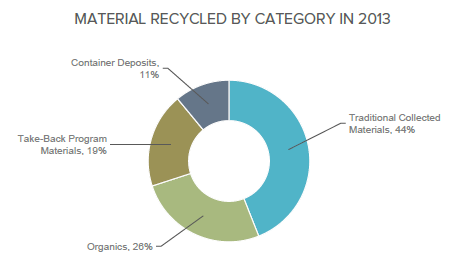 The Institute for Local Self-Reliance report, Recycling Means Business, estimates that on a per-ton basis, managing organics for the production of a valuable end product creates four jobs to the one job created if that material is disposed. The environmental, resource, and economic potential should make the development of sustainable organics management a priority for an economy based on agriculture, fresh water resources, and "Pure Michigan." In spite of these and other benefits, landfill disposal is still the most common method for managing waste organics in Michigan. Many factors conspire to maintain this practice. Michigan's well-developed disposal infrastructure and categorically low disposal rates throughout the state demonstrate the efficacy of the state policy to ensure that Michigan municipalities and businesses have ample capacity to dispose of waste. Landfills, however, are engineered to exacting and expensive specifications to control toxic releases resulting from the disposal of municipal solid and hazardous waste. Such controls are overkill for organic material and squander valuable resources. The market dominance of landfill disposal makes its low cost the only measure most decision makers see. If we rely on market conditions alone, the establishment of solid waste disposal alternatives will lag. Modify existing regulations to reduce and ultimately eliminate pricing preference for waste disposal. Create and fund a regulatory structure focused on program performance that levels the playing field for composters and provides meaningful assurance for communities. Provide compliance assistance to producers and enforce regulations. Create and support a facilitated Organics Management stakeholder workgroup to identify pathways to increase organics diversion and make sustainable organics management an integral part of materials management policy and planning in Michigan. Increase food scrap donation by identifying and removing barriers, providing education, protection, and incentives to food processors and the food service industry. Educate about and incentivize the use of compost to appropriate industries. Foster the development of organics management programs through education and grant funding. Updating Michigan policy and supporting the organics management industry is essential if we are to accomplish our recycling goals. Driving public and private investment to manage organic waste as a resource benefits Michigan business and environment. Continuing to advocate for effective organics management is key to a sustainable Michigan future. Comments on "Organics Diversion is an Important Part of the Michigan Recycling Solution"